Lash Blossom is a premier eyelash extension boutique based in Sydney CBD, specializing in semi-permanent lash extensions and eyebrow design services. Established by Lin in 2015 Lash Blossom takes great pride in offering high-quality eyelash extensions and flawless lash lift services, using only the best products available on the market to ensure the ultimate comfort and satisfaction. At Lash Blossom, we aim to provide our clients with the best eyelash service in Sydney and eyebrow design services in a relaxed and professional atmosphere. The staff at Lash Blossom have many years of experience and are here to offer exceptional service catered to each individual. Our lash technicians are more than happy to hold a consultation prior to the appointment to determine a design that would best suit your eyes, regardless of whether you are looking to treat yourself to a gorgeous set of lashes for a special event or simply to forgo the daily hassle of makeup. Our technicians are highly capable of creating a variety of looks using lash extensions of the appropriate length and curl for your natural lashes and will customize the shape to your liking. We are here to ensure that you have the best possible experience here at Lash Blossom and that you leave with a smile on your face and a set of luxurious lashes. Lash Blossom offers classic, individually applied silk or mink eyelash extensions that are perfect for everyday wear. The Full Blossom set accentuates your natural lashes by adding length and slight volume, giving you a subtle yet elegant look. Individual application. ​The Glamorous Blossom set is well suited for those after a slightly fuller and more captivating look as it adds volume and flair without being overly flamboyant. Individual application. The Russian Volume sets offered at Lash Blossom Sydney eyelash extensions are perfect for creating a luscious look, suitable for any occasion. lightweight and fluffy, making them excellent for creating an incredibly lush and stunning set of lashes. The volume lashes are fanned out by hand in a meticulous manner before being applied to the natural lashes and the number of extensions applied can be adjusted to create a more natural or dramatic look. A half-set of eyelash extensions that is ideal for a delicate cat-eye look and only applied from the middle of the eye to the outer corners. 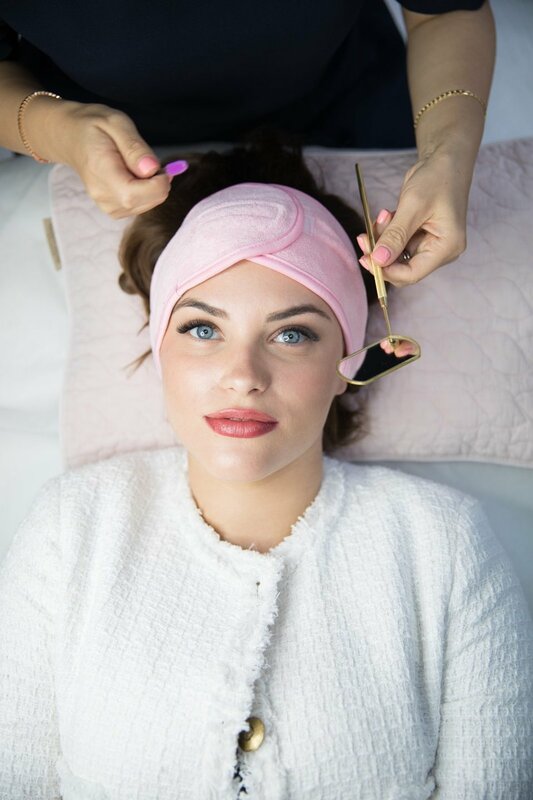 With Lash Blossom’s lash lift, you can illuminate your eyes and enhance the appearance of your natural lashes by using silicon pads to create a graceful curl that lasts up to five weeks. Your beautifully lifted lashes require little to no maintenance at all and can be combined with a lash tint to do away with mascara completely. Lash Blossom’s waxing services are performed using premium high-quality wax, allowing you to enjoy beautifully curved and well-defined eyebrows. To complete the look, you can opt for a long-lasting tint to colour both your eyebrows and eyelashes.